I have had more than a few requests for the ability to slice and dice the data in my spray chart tool by teams instead of just individual players. As of today, this new functionality is live. Let’s see what you can do with it. We know the Royals have a great defensive outfield, but now with the ability to filter by teams we can see how well their outfield has performed on balls in the park this year compared to last year. On the Player – Year to Year tab, select all batters and set the pitching team to Royals. Then, exclude home runs from the Outcome Type filter. Finally, restrict the distance of the batted balls to at least 140 feet to weed out plays by infielders as much as possible. Looks like they have been about .6 runs better per 100 balls this season versus last year. How does this compare to other teams this season? For that, I’ve created a new tab labeled Team Leaderboards. 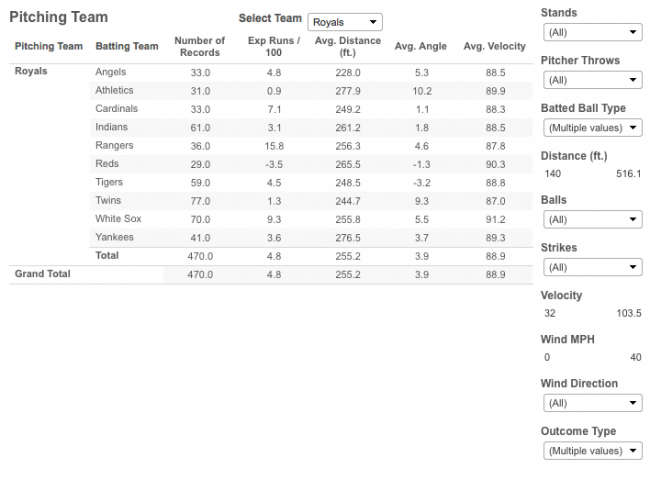 This tab allows you see how teams have performed both batting and from a pitching/fielding perspective. Let’s take those same parameters from the Player – Year to Year tab and use them on the Team Leaderboards. On the Pitching Team table, select Royals from the drop down menu. How does that compared to the rest of the league? To answer that, simply select All from the same drop down menu. Each team has a row with their own subtotal to make it easier to compare. And while the Royals have performed extremely well on these types of batted balls, they rank third behind the Rays and Angels. We can also use this feature to dig into individual players. Let’s take a look at Cubs rookie Addison Russell. Wow. Russell has put 10 balls in play against the Cardinals for a whopping 36.6 runs per 100 batted balls. Only two of those 10 balls have stayed in the infield. Can you use the tool to look at individual defensive players? Sort of. Take the example of Juan Lagares. From this view, these balls have resulted in 4.6 few runs per 100 since Lagares started anchoring center field for the Mets, and improvement of about 40 percent. Not too shabby. Of course, this is a very different way to view performance, and I would not substitute or even directly compare these results to defensive metrics like DRS or UZR. Feel free to comment with any questions or suggestions as you play around. Finally, my code for pulling and preparing the data can be found on GitHub.